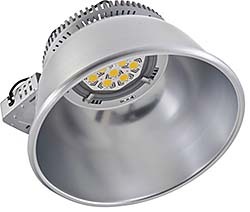 The CXB High Bay LED luminaire delivers 23,000 lumens with a CRI of 70 and CCT of 4000K. It weighs a maximum of 14 pounds, and mounts via J-box, pendant, or hook and cord. Luminaire measures 17.81 inches across and 15.56 inches deep. 70,000-hour rated lifetime.